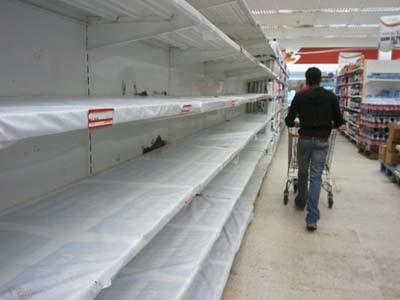 For the Venezuelan State, being informed about food shortages is hazardous for your mental health. The government is pulling out all the stops to contain the wave of shortages, from importing our way out of this mess to militarizing supermarket check-outs. But Nicolás Maduro believes the cause of the problem is the “psychological warfare” coming from the media. Therefore, he has declared that all news related to shortages are war propaganda and media outlets which report them will be punished. Even though shortages have been officially acknowledged by State institutions like the Central Bank, the government thinks that pressuring non-hegemonic media outlets further into self-censorship will make the problem go away of people’s minds. Any excuse to censor the media is OK, so long as it is kept quiet. The thing is, you don’t need to buy the papers to know the shelves are empty. UPDATE: The first inquiry is now underway. Broadcasting authority CONATEL has opened an administrative investigation against Globovision for “spreading elements that could create public anxiety by covering the issue of shortages”. This is the first legal action against the channel since its recent change of ownership.